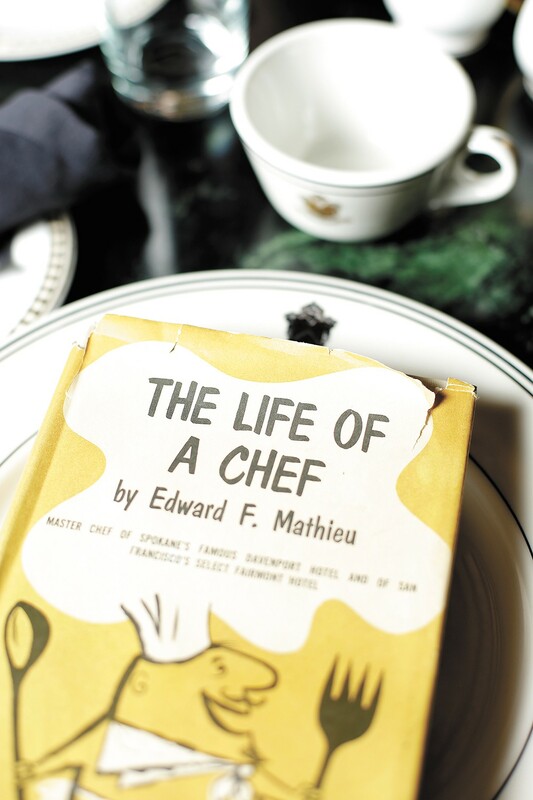 Early Davenport Hotel chef Edward Mathieu left behind his memories in this now rare memoir. If you take the stairs to the second floor mezzanine of the Davenport Hotel and walk around the perimeter, you'll come across a certain glass case. 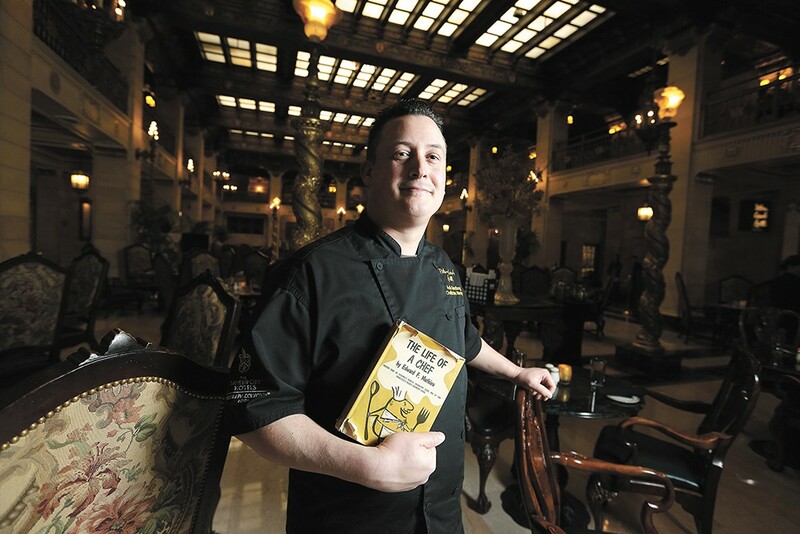 It's easy to miss if you're not paying attention, but if you lean in, you'll catch a glimpse of a book called The Life of a Chef: Master Chef of Spokane's Famous Davenport Hotel and of San Francisco's Select Fairmont Hotel written by Edward F. Mathieu. Who is Mathieu, and why is his book in the glass case? I'm glad you asked. Crack the book's cover and you'll meet a young man growing up in the Savoy region of France, leaving home and family to become an apprentice in a French hotel kitchen. He works in grand hotels in Monte Carlo and Paris, including the Ritz, where he works alongside Auguste Escoffier, now recognized as one of the greatest chefs in history. At 23, Mathieu sails for New York in the company of another chef who's taken him under his wing. He lands first in the kitchen at the St. Regis Hotel. But it isn't until much later, and part way through his time at San Francisco's famous Fairmont Hotel, which he helped to open, that he finally earns the title of chef, at 33. Chef Mathieu's story intersects with Spokane in 1917 when he receives a letter from "Mr. L. M. Davenport, president and owner of the Davenport Hotel." The letter contains a picture of the hotel and an invitation to meet at the Palace Hotel in San Francisco. "Of all of the places I had in mind, Spokane was the last," Mathieu writes. Somehow, Louis Davenport succeeds in convincing chef Mathieu to throw in his lot with the Davenport. Mathieu and his wife Louise move to Spokane, sight unseen. Since the hotel's opening in 1914, three chefs had already come and gone. When he arrives in 1917, Mathieu becomes the fourth. Still, Mathieu is skeptical of Spokane and the Davenport at first, but the city soon wins him over: "As far as I could see there was a tremendous area of natural beauty. Spokane appeared to be a new, progressive city built on a solid foundation," he writes. But though he fell in love with Spokane and the surrounding area — building a home on the South Hill in 1926, fishing at Priest River and spending warm days at his cabin on Hauser Lake — the Davenport is the center of his Spokane life. "My greatest interest was in the hotel. Would it justify my ambitions?" he writes. "I was soon to learn that I was in the right place and in a great hotel rightfully advertised as 'America's Exceptional Hotel.'" The greatness of the Davenport largely stemmed from the care Louis Davenport put into running the business (including traveling to San Francisco to select a well-known chef). "Mr. L. M. Davenport was a man with exceptional intelligence and ability in the hotel business. He was a man of refinement. In our 30 years of association, I had the privilege of knowing him well. In fact, we took our luncheons together almost every day during the last 15 years I was with him. I owe much to him." Though Mathieu doesn't say it, it's clear that the Davenport also owes much to him: "Mr. Davenport gave me full authority. 'That is entirely your business and you are not working for me, but with me,' he would say. He was extremely cooperative in every way." 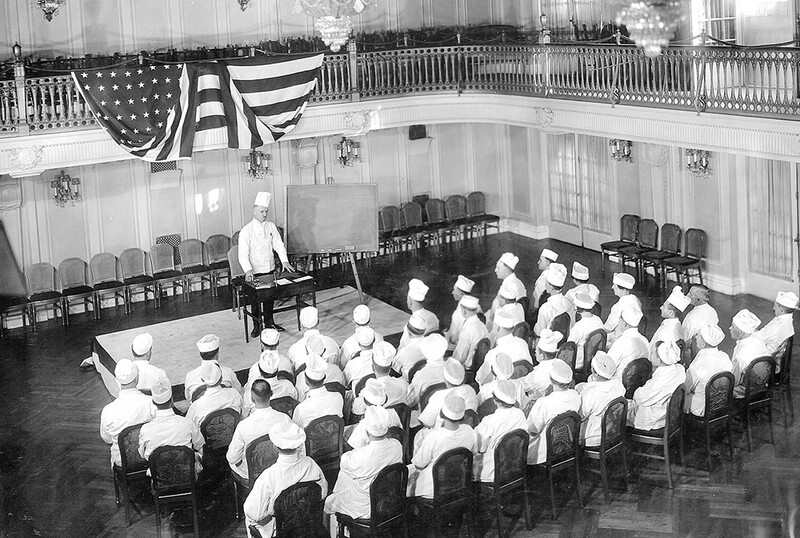 Chef Mathieu speaks to the Davenport's culinary team in this 1922 photo. Although there were important guests and dignitaries visiting and dining (Mathieu's little list includes "many presidents, the queen of Romania, the ex-empress of Austria and her family of princes and princesses, great divas, Marshal [Ferdinand] Foch, governors, senators, Supreme Court judges and government secretaries") he was deeply aware of the needs of those traveling for business and locals who wanted to come and dine on wonderful food surrounded by luxury. Mathieu brought elaborate and sumptuous French cuisine to Spokane that was served alongside a menu of American favorites. Picture this: "We had a seating capacity of 2,300 without counting the lobby and mezzanine floor, where another 1,000 could be accommodated for special occasions. We had four dining rooms serving the public for breakfast, luncheon and dinner." It's fair to say that things at the hotel were hopping. Aside from daily meals, there were special events and parties. Pictures from the Davenport archives show delicacies in the shape of flower-adorned straw hats and cakes festooned with edible ribbons and bows. Every dish is arranged with flair. Chef Mathieu seemed to take pleasure in the creative challenges that special events and orders required. Near the book in the glass case is a picture of him next to a cake in the shape of the Old National Bank building. He includes the story in his book: "In 1927 we made one of the biggest and most beautiful cakes ever served for the Old National Bank. It was made to celebrate the bank's 25th anniversary and was in the form of an exact replica of the bank building of 18 stories. It weighed 1,100 pounds. This was not a small undertaking. With Otto, my pastry chef, we adorned it with pieces of gold and silver and had a picture made, which was printed on the front page of the local newspaper and in hotel magazines. Many people thought it was the Old National Building itself. It was a remarkable piece of work and cost the bank $850, which was quite a sum for those days. We took it to the bank's lobby where it took four cooks and several hours to cut and serve the cake to the multitude of people who had been invited." Chef Mathieu spent 30 years as the Davenport's head chef, though he was laid off for a time during the Great Depression and sought his fortunes in California until being asked to return. After Louis Davenport sold the hotel, Mathieu stayed on only a short time, leaving in 1944 and running the catering department of "a large social club" in Spokane, which he notes as an uncharacteristic mystery in the memoir, until his retirement. Chef Adam Swedberg is reviving Mathieu's legacy. Standing in the Davenport now, restored to a glory chef Mathieu might have recognized, it's not difficult to picture the chef at work, surrounded by elaborate ice sculptures and sumptuous dishes served in courses. Adam Swedberg, the latest to follow in chef Mathieu's hallowed footsteps, is finding ways to make glimpses — and tastes — of that experience available to visitors today. Swedberg became aware of chef Mathieu only a few months ago, when a member of his staff showed him a copy of the memoir listed on eBay. At the time of this writing, only two books were available for sale online, both for more than $100. One rare copy is for sale locally at Atticus Coffee & Gifts for $75; you can also find a copy in the collection of the Northwest Room at the Spokane Public Library's downtown branch. Beyond the telling of his life's story, chef Mathieu includes a few recipes in the book, including one for Louis salad dressing, the excellent topping for the Davenport's signature Crab Louis salad. Swedberg has since hosted a special brunch, revamping the brunch menu to include a few of Mathieu's recipes, including barbecued short ribs, Chicken a la Reine (with peppers and Tabasco) and Mathieu Special soup (which includes squash and an entire sliced head of lettuce). Earlier this year, he served a meal based on the fare passengers ate on the Titanic and hopes to continue probing into culinary history, with an eye to chef Mathieu's legacy. "It's great to look back and see how it all started," says Swedberg. "I'd love to keep carrying on that tradition and designing some fresh sheets and some more multi-course menus." For Swedberg, it's like discovering treasure in his backyard. "For you to tell me that he worked with Escoffier, it's so exciting, how many people can say that?" he says. "How did we not know about him?" In 1958, when chef Mathieu wrote the story of his life, he wrote this in the preface: "My story was written in Spokane, Washington, the city I love and where I have spent the greatest part of my career, a lovely city of the great Northwest, where people still call me 'Chef.'" The original print version of this article was headlined "Chef's Notes"